Bentley Motors yesterday announced, in Pebble Beach (California), that the glamorous four-seater convertible show car unveiled at the Los Angeles Motor Show in January 2005 will carry the evocative Azure name. The new Bentley Azure goes on sale in the northern spring of 2006. The new Bentley Azure is an elegant four-seater convertible that provides a powerful and refined open-top driving experience while offering a unique blend of classic Bentley design and craftsmanship. The new Azure is the latest in a long line of much-admired Bentley convertibles, its design inspired by the 1955 Park Ward S1 Drophead Coupé and the original Azure introduced in 1995. Like its iconic predecessor, the new Azure becomes the flagship of the Bentley model range, reaffirming the company's status as the prime provider of four-seater convertibles at the very pinnacle of the market. 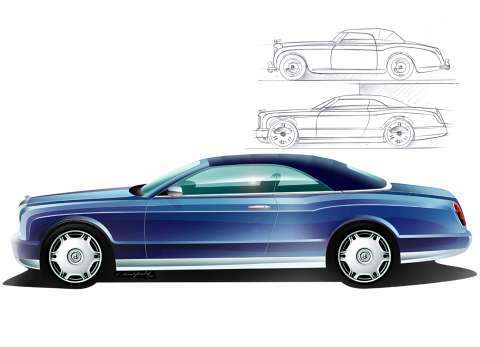 Customer reaction to the Los Angeles show car, unveiled with the project name of Arnage Drophead Coupé, demonstrated the overwhelming demand for a top of the range Bentley convertible. "We have been inundated with demand for a new Azure virtually from the moment the original model ceased production," says Adrian Hallmark, member of the board, sales and marketing. "The exclusivity, style, luxury and performance of the new Bentley convertible flagship evoke the Riviera lifestyle like no other, fully justifying the revival of the Azure name." Further details, including final technical specification, market availability and pricing, will be released in due course.